VILLINGILI KANDU is a channel located south of Villingili Island in Maldives, which offers rare and technical conditions to observe many grey reef sharks. Different dive options are possible in the north and south of the channel, but the most spectacular show takes place at the center. The edge is very deep, and the channel mainly presents a sandy bottom. It is highly recommended to explore this site during incoming currents. The water entry is usually performed at the mouth of the channel, north or south. It is possible to enter in the center for experienced divers, but this option is more prone to scaring wildlife. Divers will need to enter with no air in the BCD and staying minimal time at the surface. At the beginning of the dive, divers often have the strange feeling of flying underwater. Divers will feel the current more and more as they approach the mouth of the channel. 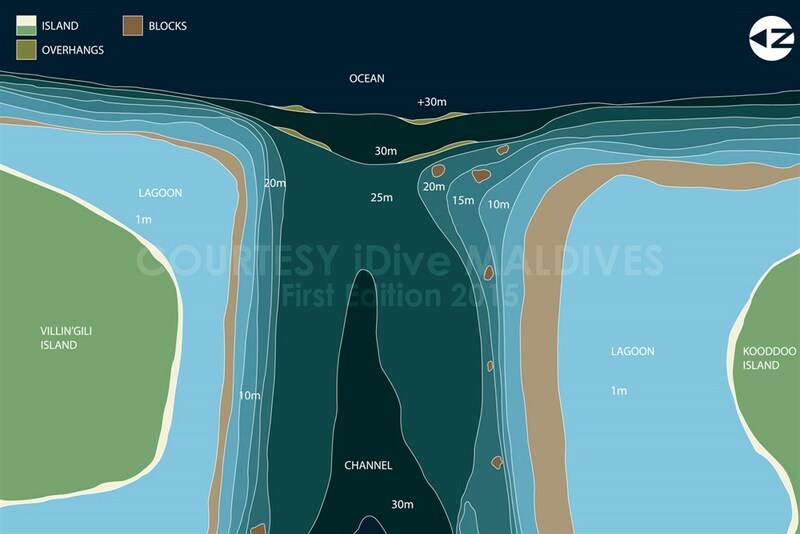 Before being pulled inside the channel by the currents, divers will first need to descend at 30m at a small wall located a few meters from the edge. When at the observation point, divers can watch the show while using the reef hook and checking the pressure gauge and computer. When reaching the no-decompression limit or 60 bar, it is possible to complete the dive by drifting inside the channel in order to reach the north or south reef. The ascent and safety stop can be performed both in open water or along the reef. The main edge is too deep to be practiced. Some operators may take divers deeper than 30m but this is prohibited and may cause injuries which may not be covered by insurances. Always keep in mind to stay on the safe side when diving in the archipelago. This diving site is particularly interesting during the northeast monsoon, and is suitable for advanced divers with a good experience of the current and deep dives. The use of a reef hook is recommended in order not to damage the reef, and will be much appreciated by photographers.